If there's a World's Most Boring award, I'll win it. THE most boring knitting project ever. One hundred & eighty stitches per row of garter stitch in white. Ugh. Actually, it's Ecru. Ecru makes it even more boring because there's a tiny bit less concern about getting the knitting dirty. It's a required project though, so I'll press on. My most exciting action today has been getting my hand knit winter socks washed, folded and put away. 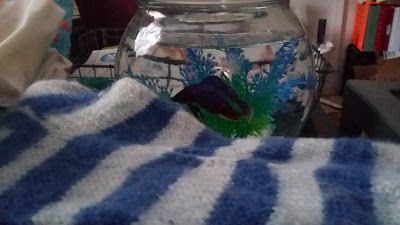 New Fish kept me company while I did the folding. New Fish is still unappreciative of his plastic plant. He still does the "Something touched me!" panic thing when he bumps it plus, I think it may be shredding his long fins/tail. The plastic plant is going to get tossed tomorrow when I clean out his bowl. I have been able to get some reading done this week. 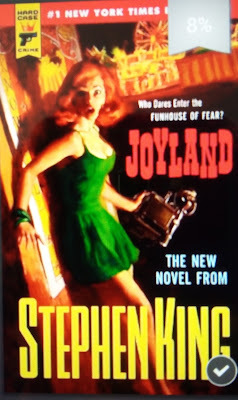 I'm now 84% through Joyland. I'm enjoying it but it's not the typical Stephen King book. Despite the numerous similarities to my work life, there haven't been any scary parts. There's been lots and lots of foreshadowing, but I haven't gotten the first cold chill and I haven't had any major freak-outs while alone and in the dark at my own amusement park. Not yet, at least. I keep waiting for it though. The amount of foreshadowing plus the lack of scary clowns factor keeps me on the edge of my seat. I keep waiting for something, something really big and horrible, to suddenly jump out and terrify me. 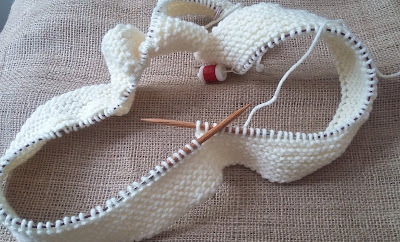 To see what others are knitting and reading this week, check out Ginny's Yarn Along. I don't know if you have watched Buffy the Vampire Slayer but your title was completely voiced in my head by Allison Hannigan... Not sure that was intentional but there it is! I hope you can get through the boring knitting soon! Sometimes, plain old knitting is just what is needed!! And, you are the second person I have come across reading this King novel. I might need to read this, I don't generally like his novels, but it looks interesting! Give Joyland a try. It was definitely one of Mr. King's calmer/less evil stories. It's just something I made up. I'll describe it more after I've put the finished gift in the mail. It's a stockinette/reverse stockinette checkerboard center surrounded by a garter border.